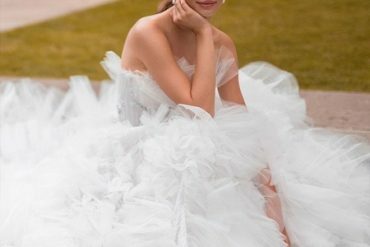 Ready to feast your eyes on some amazing, ultra-swoonworthy wedding dresses? Great!! You’re in for a treat because today we have all of the gorgeous wedding gowns from Irena Burshtein’s stunning 2018 bridal collection, which is brimming with breathtaking looks that you’ll say BIG Yes! Irena Burshtein is a well established Israeli designer of bridal gowns and evening dresses. With vast experience in haute couture, the studio offers a range of unique designs and custom made dresses. We love the dress below with jewel transparent neckline , beaded bodice and flowy skirt lends this gown femininity and will make you feel gorgeous throughout the whole day.